A thrilling board game using ingenious codes, riddles and logic problems. Will you be the Grand Master of The Da Vinci Game? The Ankh, an ancient Egyptian symbol of life, was often carried by the Egyptians as an amulet providing protection. In the game it is both the starting and finishing point. There are as many theories as to the exact meaning of the Ankh as there are Ankhs, everything from a stylized womb to a sandal strap, but no single theory has been universally accepted. The Ankh is often depicted being carried by a god or goddess, particularly the Goddess Isis, sometimes touching a human, symbolizing conception. The codex is a manuscript, used since the fourth century, made of parchment or papyrus and is the predecessor of the modern book. It is useful for secret messages that may need to be hastily destroyed as it corrodes easily. Leonardo Da Vinci also used backwards writing and other codes on the codex for added secrecy. They are used in the game for riddles revealing a secret word. The key is a symbol of power and of wealth, it denotes power over whatever it is that the key unlocks. In fairy stories a key represents a mystery to be solved or an indication that the hero or heroine is a step closer to their goal. This key is topped by the lily of France or fleur-de-lis, which originated in Egypt and was then adopted by the Merovingians to signify their sacred origins. By the 14th century, the three petals were said to represent faith, wisdom and chivalry. The concept of a key is used here as the symbol for the logic clues, where logic is needed to unlock a numeric answer. Roses are a traditional gift symbolizing romantic love. They have different meanings depending on their color, the white rose is symbolic of innocence and the feminine and the red rose, true love and the masculine, in The Da Vinci Game a pink rose has been used to signify a graceful merging of both feminine and masculine. Less commonly colored roses include yellow for platonic love, orange for passion and blue for mystery. The rose has been used here to denote geographical locations on our planet, many of them, but not all, reflecting the beauty of the rose. The Vitruvian Man was painted by many artists of the Renaissance and since, this was supposed to show the perfect human dimensions and is indicative of the divine number Phi. 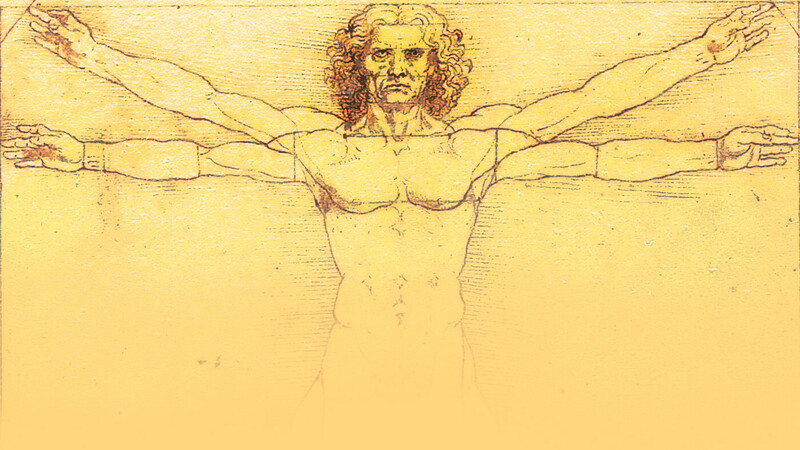 In The Da Vinci Game, the Vitruvian Man represents creative genius, art, music, film, and literature and the amazing people who created them, their names and creations hidden in anagrams. The triskel or triskelion is symbolic of the three stages of womanhood, the Maiden, the Mother and the Crone and tied to this is the concept of eternity, with the three spirals representing the Past, Present and Future. It is often considered to be a Celtic symbol however actually predates the Celts, having previously appeared in the Mycenaean era. Here it gives free turns or extra tokens to help players reach their goal. For the Greeks, the owl was associated with the goddess Athena, who was a bird goddess and could take the form of an owl. She was considered spiritual and wise. The owl was also considered by many other ancient people, including the Celts and Native Americans to symbolize the qualities of spirituality and wisdom. If you find yourself drawn towards the owl for your playing piece, maybe this indicates your wisdom, spirituality and grace, or perhaps you just stay up all night, live in a tree and snack on mice. The dolphin is seen as a joyful and playful animal of the sea and has always symbolized fun and harmony, playfulness and joy, both now and in ancient times. In the 'Hitchhiker's Guide to the Galaxy' by Douglas Adams, dolphins are a highly intelligent species (second only to mice) and attempt to warn the humans of Earth's impending destruction to make way for an interspatial bypass. Unfortunately humans are too stupid to understand their message and the dolphins flee Earth shortly before its destruction. A significant symbol of femininity and independence, the cat has been regarded as the embodiment of mystery. In ancient Egypt, she had her own goddess, Bastet. The cat has always been seen as a sacred familiar to witches. In Vietnam the cat is one of the signs of the Zodiac, an alternative to the rabbit in the Chinese Zodiac. The cat means many things, perhaps because cats can be both independent, gentle play mates and wild predators. Leonardo himself said 'The smallest feline is a masterpiece'. Bells are often used in rituals to focus the mind, summon spirits and cleanse an area of negative energy. Their shape also signals femininity and they are used in broadcasting news, both good and bad. The most famous bell is perhaps the Liberty Bell, which on 8 July, 1776 summoned the residents of Philadelphia to hear the reading of the Declaration of Independence. The chalice is an ancient symbol. Long before it became the symbol of the Holy Grail or the cup that caught Christ's blood, it was completely female in its symbolism, from the water it carried, the female element, to its shape as a womb-like receptacle. Given the origin of this symbol, it is no real surprise that books now abound claiming that the Holy Grail was in fact Mary Magdalene. The Holy Grail is conspicuous by its absence in Leonardo Da Vinci's painting of The Last Supper, where instead of just one chalice on the table, each disciple has their own cup. This shell was originally called an Ammonite because of its resemblance to the ram-like horns of Ammon, the Egyptian god of life and reproduction. It is found on all continents and is the fossilized shell of an extinct mollusk. Some say that it is a symbol of the complexity and interconnectedness of life, others perceive it as an icon of friendship and when worn it is thought to help the wearer build stronger relationships. 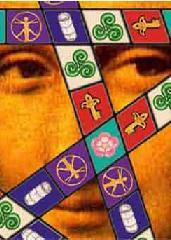 The Da Vinci Game uses as its board the Pentacle, an ancient symbol representing peace, harmony and cosmic order. Each point of the Pentacle has a different meaning and these are written in reverse writing round the outside of the circle: The All, Spirit, the Divine. Intelligence and the Arts. Stability and the Physical. Courage and Strength and lastly Emotions and Intuitions. Since ancient times these have all been guiding forces for the good of humanity. Never more so than now do we need to be reminded of the importance of the balance and harmony between all the people of the Earth and between humanity and the natural world. 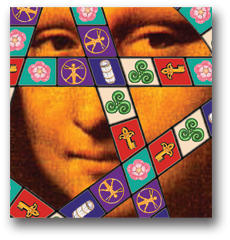 Looking out from behind the pentacle is Leonardo's most famous painting, now called the Mona Lisa. There is actually no record of Leonardo himself naming this painting, it got its name instead from Giorgio Vasari's biography of Leonardo, published in 1550 after his death. In the biography, he identified the sitter as Lisa Gherardini, the wife of a successful Florentine businessman. Her name will have been prefixed by 'Mona', which is the short form of the Italian 'Madonna', meaning 'my lady'. An alternative title for the painting is La Gioconda. Both 'Mona Lisa' and 'La Gioconda' have only been in common use since the 19th century, before which time the painting was referred to as 'a Florentine lady' or by other similar names. Leonardo carried this painting with him all his life, held it so dear and never considered it finished. The Mona Lisa epitomizes the constant experimentation and the quest for understanding of this incredible mind and Mona Lisa's smile is considered by many to be the ultimate enigma.